There was a reason why Racing Club were firm favourites to beat Banfield in Avellaneda but the league leaders found goalkeeper Mauricio Arboleda in inspired form. The Colombian made five saves, one tremendous point blank stop to deny Ricardo Centurión, as El Taladro frustrated the league leaders to held on for a point. It has perhaps been an underwhelming campaign so far from one of the Superliga’s outstanding right-backs, as it has for Talleres in general, but Leonardo Godoy was back to something close to his best in the win over Argentinos Juniors. The 23-year-old is always a willing runner and provides useful width to the side but also made three interceptions and three clearances in the clean sheet. Back at Atlético Tucumán after a disappointing spell with Newell’s Old Boys, Bruno Bianchi is proving his worth to El Decano once again. The 29-year-old headed an important equaliser in Córdoba and played a vital role in ensuring that Belgrano couldn’t find a way back into the game. 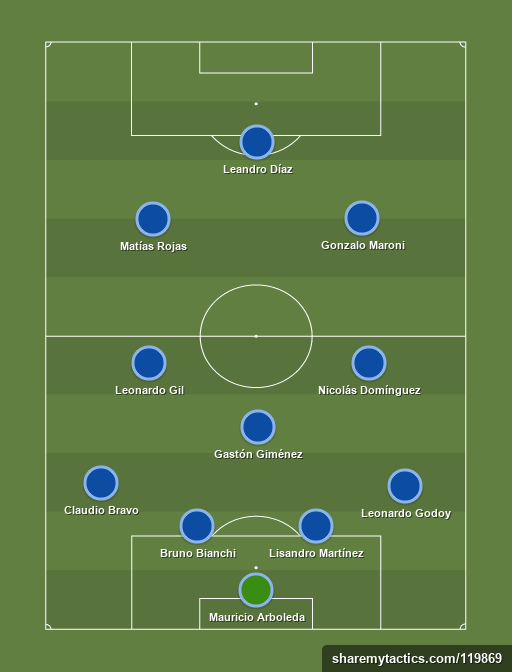 Yet another week in the Team of the week for Lisandro Martínez and if the 20-year-old’s 11 clearances and 100% tackle success were not evidence enough of his defensive capabilities, the accurate long ball over the top to create Defensa y Justicia’s opener illustrated the other impressive facet of his game. Without question one of the top prospects in the league and a key factor behind El Halcón’s lofty position. Goalkeeper Arboleda took the majority of credit for Banfield’s clean sheet and subsequent point away to Racing but it was a great defensive performance. Claudio Bravo had his hands full with Ricardo Centurión opposite him but the 21-year-old made 12 tackles (100%) and six interceptions to keep La Academia out. Rewarded with a place in Lionel Scaloni’s Argentina squad Gastón Giménez continues to show just why he deserves international recognition as the lynchpin in Gabriel Heinze’s side. Dropping back in between the centre backs, the 27-year-old made eleven clearances and five interceptions which allows Vélez’s midfield and full-backs to push forward safe in the knowledge that Giménez will cover. Central finally ending their winless streak in the Superliga came on Saturday evening with victory over Estudiantes and Leonardo Gil’s display in the centre of the park was instrumental. Winning possession six times, the 27-year-old also completed three dribbles and made 90 successful passes, 39 more than the second highest on the pitch. Alongside Santiago Cáseres previously and now Gastón Giménez, one of the beneficiaries in Vélez’s system has been Nicolás Domínguez. The talented 20-year-old is still a good ball winner, making four tackles in the win over Unión, but is able to push forward and support the attack as he did in latching on to Matías Vargas’ through ball to open the scoring. It was with good reason that Talleres were so desperate to add Gonzalo Maroni on loan and while Boca Juniors weren’t too keen on the idea, it has been an invaluable experience so far. The 19-year-old tapped in La T’s second in La Paternal but was also a constant nuisance to the home side with his dribbling ability and eye for a pass. There have been no shortage of success stories in Defensa y Justicia’s recent transfer dealings but Matías Rojas looks to be another hit for El Halcón. The Paraguayan tallied up his sixth goal of the season to open the scoring in the win over Tigre but with five tackles, three completed dribbles and two key passes it was a terrific all-round midfield display. Leandro Díaz’s replacement after 67 minutes Luis Rodríguez usually steals the headlines and La Pulga did so again with his wonderful late goal but prior to that Díaz had been a constant source of problems for Belgrano’s defence. Strong in the air, the well travelled striker provided a focal point to Atlético’s attacks and scored the vital second to put El Decano in front. ← Will there be a Copa Libertadores Final?